Give the gift of light in the safest possible way with this sweet LED candle. Lovely as a nightlight, this LED candle features a flickering light wick powered by 3 x AAA batteries (not included) and is coated in real wax for an added effect. 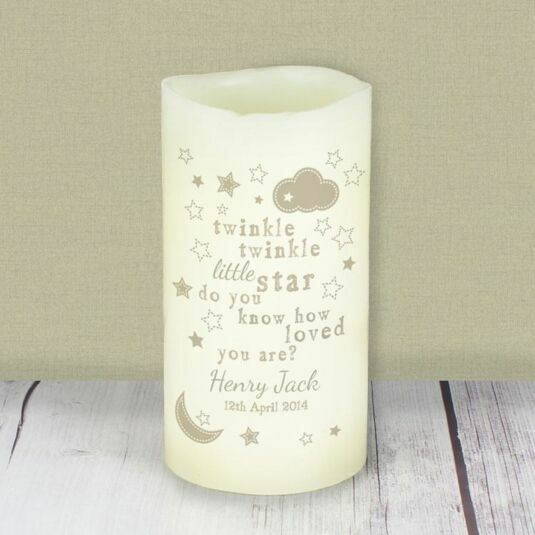 This candle is designed using the ‘twinkle twinkle’ graphics of stars, clouds and a moon with the wording ‘twinkle twinkle little star do you know how loved you are?’ printed on the front of the candle in an off-gold font. This would make the ideal gift for a christening, for a new-born or a birthday. 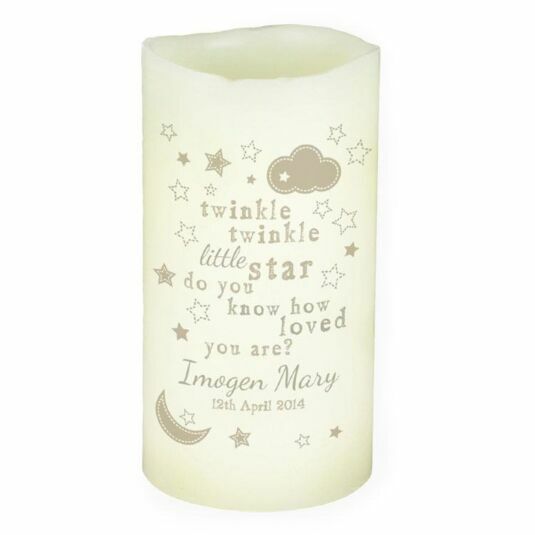 The words ‘twinkle twinkle little star do you know how loved you are?’ are fixed text and cannot be personalised. Add a name, with a maximum of 20 characters, to appear below the fixed text. Add a date, with a maximum of 20 characters, to appear below the name in a smaller font.